Christmas is the day “around which the entire kid year revolved,” the writer and radio personality Jean Shepherd correctly notes, which is why it’s surprising that few works of art have captured that sense of anticipation. A lot of holiday movies feature young protagonists, but outside of A Christmas Story—co-written by Shepherd, and based on his writings—almost none tell a natural story (that is, sans a supernatural or other high-concept element) about how December gets more and more intoxicating as the 25th approaches. A Christmas Story is mostly pulled from four pieces in Shepherd’s story collection In God We Trust: All Others Pay Cash, and three of the four come from early on in the book, which is gently structured around the growing maturity of Ralphie Parker, a narrator who can be viewed as a Shepherd surrogate. Director Bob Clark, who also made that other holiday staple, the slasher Black Christmas, was smart enough to trust that a kid’s anticipation of Christmas would be drama enough, and that any kind of character epiphany or narrative arc would be superfluous. (Including such an arc is one of the many mistakes made by A Christmas Story 2, a terrible cash-grab sequel.) By avoiding the second half of the book, which charts Ralphie’s growing awareness of adult issues and the problems other people face, Clark keeps his focus purely on what the season is like for an average kid. The only lesson to be learned from Shepherd’s Christmas is that getting gifts is fun and that kids are goofy. Leave the more profound morals to that other adolescent standard: the summer after which nothing was ever the same. In God We Trust’s chapters alternate between a modern section, where an adult Ralphie returns to his hometown and reminisces with a childhood friend, and ones that recount those memories. While the book is listed as fiction—Shepherd says any resemblance to reality was “purely coincidental, accidental, or the result of faulty imagination”—it’s clearly drawn from his own experiences. Some of the details were likely invented or exaggerated, but the verifiable changes barely qualify as tweaks. (Shepherd grew up in Hammond, Indiana, which here becomes Hohman, a fictitious setting in the same geographic location.) It seems fair to say that if something didn’t happen to Shepherd himself, a version of it happened to someone he knew. The collection’s final story, which bookends the gentle materialism of the first, is about the hardships Hohman faced during the Depression. Specifically, the desperation that ensues when a movie theater offers various promotions to draw in business, including a lottery where winning “meant the difference between actual Life and gnawing, grubbing, penny-scrabbling, bare Existence.” This story, while still comic thanks to the narrator recounting the events from a distance, is probably closer to 50-percent adult in its awareness of the world. A version of it appears in My Summer Story, a.k.a. It Runs In The Family, Clark’s kinda-sequel to A Christmas Story that adapts other Shepherd stories. Pointedly, that film ends with the tale Shepherd credits with his first feeling like an adult, joining his dad and dad’s friends for a round of dirty jokes after a successful day of fishing. Keeping the storylines so kid-focused doesn’t mean the story is childish or low stakes. On the contrary, the book and movie draw most of their humor from the contrast between how high the stakes are for Ralphie, and how low they are for the rest of us, looking back on childhood with years of perspective. That thematic perspective is especially pronounced in the film, where Shepherd—who narrates and is credited as Ralphie as an adult—gets far more dialogue than his childhood equivalent (played by Peter Billingsley), clearly aligning us with his point of view, as opposed to young Ralphie’s. The sharpest gags in both versions stem from Ralphie’s overactive imagination, his view on how the world works based on how he thinks it should work. In one of the funniest moments of the book or film, Ralphie attempts to suggest why his getting the gun would benefit the entire family by casually mentioning how grizzlies are running rampant through the neighborhood. Later, he jumps at the opportunity to write an essay about what he wants for Christmas, convinced his prose will be so awe-inspiring that his teacher will call his house to ensure he gets the gift he wants. 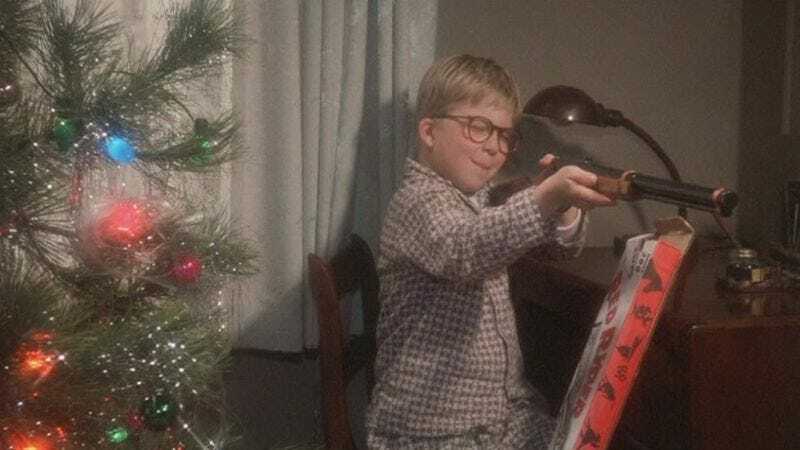 That moment is echoed by other childhood daydreams, as Ralphie’s desire for a gun manifests in heroic scenarios, “innumerable situations calling for the instant and irrevocable need for a BB gun,” as Shepherd writes in In God We Trust. “Great fantasies where I fended off creeping marauders burrowing through the snow toward the kitchen, where only I and I alone stood between our tiny huddled family and insensate Evil.” Clark finds the right tone for these sequences, with Ralphie splitting the difference between his life and what he’s picked up from pop culture. In particular, the costumes and herky-jerk motions of the bad guys seems reminiscent of early film, a period-appropriate association for Ralphie to make. Beyond the way it captures a kid’s point of view, A Christmas Story lingers as an annual favorite because it’s one of the few holiday movies that’s actually about celebrating Christmas. That is, it’s about the season—getting a tree, bundling up for winter weather, admiring local decorations—as opposed to a Santa, Scrooge, or Grinch supernatural tale, or some forced moral about the true meaning of the holiday. A Christmas Story knows full well that for kids of a certain age, the true meaning of Christmas is all about what winds up under the tree, good or bad. (One tweak from book to film: Ralphie’s horrendous full-body bunny costume in the movie is upgraded from still-embarrassing-but-not-as-bad bunny slippers in the book.) This isn’t exactly admirable, but it is understandable, and Shepherd walks the fine line between enjoying the commercial aspects of the holiday while not having Ralphie come off as a greedy brat. Tellingly, the film ends not with Ralphie receiving his dream gift, but with his parents enjoying each other’s company after the festivities have ended. Looking ahead to presents is what makes the season so exciting to kids, but that won’t be the appeal forever. Start with: This is a tricky one, as the book offers a lot more material, though the stories that make up the film feel abbreviated compared to what the movie does with them. Christmas Story fans wanting to relive the book in prose only really need to read four of the book’s 31 chapters (“Duel In The Snow, or Red Ryder Nails The Cleveland Street Kid,” “The Counterfeit Secret Circle Member Get The Message, or The Asp Strikes Again,” “My Old Man And The Lascivious Special Award That Heralded The Birth Of Pop Art,” and “Grover Dill And The Tasmanian Devil”). They may be disappointed by how other favorite sequences from the film—the kid who gets his tongue stuck to the pole, the blow-out tire that leads to Ralphie getting his mouth washed out with soap—don’t appear in In God We Trust. Ultimately, it’s difficult to imagine families settling in to read these stories every year, so for the Christmas season, Christmas Story gets the edge. But Shepherd is a wonderful writer, and fans of the film—or of comedic storytellers like David Sedaris—should be sure to check him out. His era may be long since past, but his gentle humor will never go out of style.